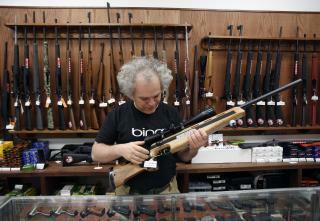 (Newser) – On Black Friday this year, American shoppers may have bought record numbers of a perennial favorite: guns. The FBI says it had 203,086 requests for background checks on Friday, smashing the previous single-day record of 185,713, which was set on Black Friday last year, USA Today reports. The actual number of guns sold may be even higher, since shoppers buying multiple firearms only require one background check. The Gun Ban Fear Mongering is really good for consumerism.. What you ask for is not always what you wish.. Much like Greenies wanting to Ban the Cutting of Trees to make paper bags.... The whole industry went to plastic.. Now even if we returned to paper.. the sea is polluted for the next 500 years.. And those trees that were saved.. are dead of old age anyway.. Good Job thinking it trough before acting foolishly..
Obviously 200,000 sexually inadequate, right wing guys who just want to kill something with their new cap pistol can't be wrong.